Copyright © J.Ralph - This image is copyrighted. Unauthorized reproduction prohibited. 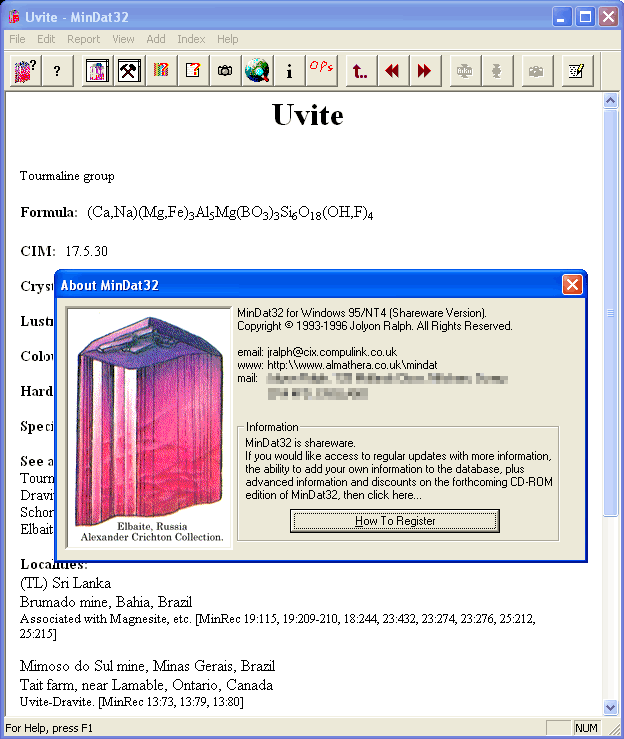 When Windows 95 came out in 1995, I rewrote mindat into a Win32 application, and for the first time the information within my database could be searched and viewed in a more structured visual way. A few copies of this were given out online, but probably no more than about 50 people worldwide ever used a copy. But the big problem was still that all data had to be entered by me, by hand, the other users of the software could not contribute. For several years I looked at different solutions to this problem, but it was only in 2000 that I came up with the plan to convert it into a website and program that so that others could edit. This was, by the way, a year before Wikipedia was launched.